Dudley Robinson trained at the Royal London Hospital qualifying in Medicine with MBBS in 1991. Throughout his training in Obstetrics and Gynaecology he has worked in and around London prior to undertaking a 3 year research fellowship with Professor Linda Cardozo in the Department of Urogynaecology at Kings College Hospital, London. He has published widely in the field of urogynaecology and research interests include the effect of hormones and drugs on the lower urinary tract. His MD thesis at the University of London is entitled ‘Anti-diuresis in the management of daytime urinary incontinence’ and investigated the use of desmopressin nasal spray as a ‘designer drug’ for women with daytime urinary incontinence. Subsequently he completed a two-year sub-specialty training program in Urogynaecology at Kings and was appointed as a Consultant Obstetrician and Gynaecologist with a subspecialty interest in Urogynaecology at Kings College Hospital in July 2005. He continues to publish widely in the field of Urogynaecology and interests include patient outcome measures in addition to the influence of drugs and hormones on the lower urinary tract. He continues to have an active role in research in lower urinary tract dysfunction within the department and supervises two subspecialty trainees and two research fellows. Currently he is Research and Development Lead in Women’s Services at Kings College Hospital. In addition he has an active role teaching both undergraduates and post graduates. He regularly gives invited lectures both nationally and internationally and is on the editorial board on the International Urogynaecology Journal. He has published over 40 peer review papers, 70 published abstracts, 55 review articles and 37 book chapters. In addition he has co-authored two books on urinary incontinence. He was appointed as honorary senior lecturer at Kings College London in 2009 and as a fellow of the Royal College of Obstetricians and Gynaecologists in 2010. He is a fellow of the Royal Society of Medicine and a member of the council for the Obstetrics and Gynaecology Section. 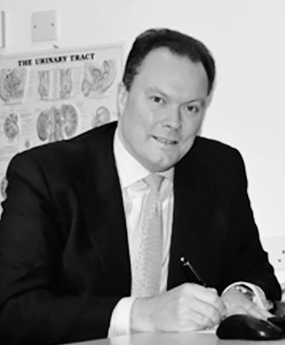 He is also a member of the International Continence Society (ICS), British Society of Colposcopy and Cervical Pathology (BSCCP), UK Continence Society (UKCS), British Society of Urogynaecology (BSUG) and International Urogynaecology Association (IUGA) and European Urogynaecology Association.